The following are instances in which licensees or other persons violated the Florida Insurance Code and the administrative action the Department has taken against them. 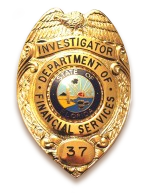 Note: All administrative investigations are subject to referral to the Division of Insurance Fraud for criminal investigation. fees greater than the statutorily required limitation for services rendered to policyholders and charged unlawful fees for adjusting services. Disposition: Probation for one year, fined $2,500, make restitution of $8,592.03, submit a new contract with a fee no greater than 10%, and not collect fees from the original, unlawful offer. Case: An investigation of a revoked customer representative under the supervision of a general lines agent, alleged he was allowed to handle a variety of personal lines insurance transactions. The revoked licensee mishandled a consumer's homeowner's insurance transaction, overcharged her and then deprived her of her cancellation refund for an extended time frame. All of these acts were committed by the revoked customer representative under the watchful eye of his supervisor, the general lines agent. Further investigation revealed that the agency routinely failed to provide refunds to consumers and overcharged numerous clients. Disposition: The general lines agent's license was revoked and she was ordered to make restitution to the victims. The revoked customer representative was ordered to cease and desist and could be subject to arrest for violating a Department order. Case: An investigation of a life and health agent alleged that he misrepresented service contracts as an insurance product, demonstrated a lack of fitness and trustworthiness to engage in the business of insurance, and made derogatory statements about an insurance company. Disposition: License suspended for nine months. Probation for one year if license is reinstated. Case: An investigation of a title insurance agent alleged that he operated and sold title insurance without having a properly licensed or appointed title insurance agency. Disposition: Fined $7,500; placed on probation for one year; and required to obtain a title insurance agency license. Case: An investigation initiated after a consumer filed a complaint that after requesting to cancel a homeowners' policy, the consumer never received their refund. The investigation showed that nearly $1,500 that should have been returned to the consumer was being held by the agent. After filing the complaint with the Department, the agent refunded $950 to the consumer. Once the Department was involved, the agent refunded the remainder of the monies due to the consumer. Case: An investigation of a customer representative alleged she used her access to consumer information to obtain a credit card using the financial information of one of the agency's clients. She made multiple charges on the card without making any payments to the account. The investigation showed that the licensee not only made personal purchases but she also took advantage of her position in the agency to steal cash and money order premium payments from several agency clients and then replaced those premiums using the fraudulently obtained credit card. Disposition: License revoked. She was arrested by the Division of Insurance Fraud and sentenced to 60 months supervised probation, 200 hours of community service, pay more than $3,500 restitution to the insurance carrier, and pay more than $1,700 in costs to the Division of Insurance Fraud. Case: An investigation of two life and health agents alleged they enrolled a consumer into a bogus health insurance product. The plan name was known by several different names including "AIM Health Plans", "Insurance Resource Group, Inc", and "Integrated Insurance Marketing, Inc." Unfortunately for the consumer, there was no authorized insurer underwriting these health policies, and she incurred unpaid medical expenses in the process. Disposition: Placed on probation for one year, fined $1,000, and was ordered to reimburse costs to the affected consumer in the amount of $3,000. Case: An investigation of a non-resident managing general agent, home warranty sales firm, and service warranty sales firm alleged that it aided and abetted an unlicensed entity, Global Warranty Group LLC.